Lobster is one of the most important fisheries in New Hampshire’s marine waters. The following is a summary of licensing requirements and fishing and gear regulations for the harvest of lobster and crab. A license is required to take lobster and crab (see License Fees & Requirements). Federal license required to fish in waters seaward of state waters. The more restrictive measure applies when fishing more than one management area. No lobster less than 3¼ inch carapace length, whether alive or dead, may be transported, bought, sold, given away, exposed for sale or possessed. No lobster greater than 5 inches carapace length may be possessed by any person holding a N.H. License to Take Lobsters (RSA 211:18). Measurements must be made from the rear of the eye socket, along a line parallel to the center line of the body shell, to the rear of the body shell. 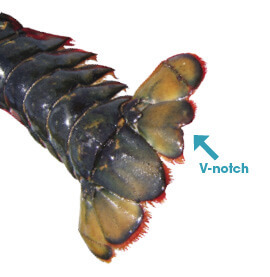 When lobster meat is removed from the shell, the tail meat must be whole, intact and not less than 4¼ inches, when laid straight and measured end to end (not including the small part that is on the body end of the tail meat). Possession of mutilated lobster, cooked or uncooked, will be prima facie evidence that they are not of legal length. Lobster meat from outside the state must meet the minimum length requirements. Hermetically sealed cans of lobster, not requiring refrigeration and not weighing over 8 ounces net, are exempt from this provision. 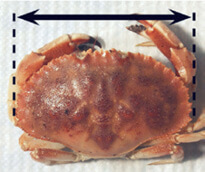 The crab carapace width must be measured in a straight line through the widest part of the shell. Any female possessing a V-notched (notched right flipper next to the middle flipper when underside of female is down and its tail toward you) or mutilated right flipper must be immediately returned to the waters from which it was taken (zero tolerance). All commercial and limited commercial lobster licensees shall immediately V-notch and return to the water, all egg-bearing female lobster captured in the process of taking lobster. No person can remove spawn from any female lobster or crab or take, serve, have in his possession, sell or offer for sale any female lobster carrying spawn or any lobster or crab spawn. No person can take, buy, sell, or possess any female lobster bearing eggs. Female egg-bearing lobster must be immediately returned alive to the waters from which taken. This does not apply to lobster spawning in holding cars or pounds if, upon discovery, they are liberated alive in the coastal waters (call Fish and Game Law Enforcement at (603) 271-3361 when discovered). Persons licensed to take lobster and/or crab by trap are required to purchase trap tags up to the maximum allowed by their license (1,200 for commercial; 600 for limited commercial if license held prior to January 1, 2006; 100 for part-time commercial harvesters; 5 for recreational). Additional trap tags are allowed for routine trap losses. Lobster trap tags are valid for one year (June 1 – May 31 of the following calendar year). A valid lobster trap tag shall be securely attached to the frame of the lobster trap in a manner for which it was designed. No more than 2 traps tags shall be affixed to traps. For more detailed information, contact Fish and Game’s Region 3 office, (603) 868-1095. Lobster and crab may only be taken by traps in state waters, with the exception that up to 12 crab may be taken by angling, diving, or by hand without a license. All trap and pot gear must be hauled at least once every 30 days. Vents cut in the side or the end of a wire or plastic trap that comply with the dimensions in 1) and 2) above. Every trap must have at least 2 parallel runners or sills attached to the bottom of the trap, running along the entire length of the exterior. Of sufficient size to create an opening of at least 3¾ inches x 3¾ inches when the panel is removed or opened. Must have at least two runners and an escape panel which will create an opening of 3¾ inches x 3¾ inches when open. These construction designs must be approved in writing by the Fish and Game Director. Every trap must have at least two runners and an escape panel. An escape panel can be created by one untreated, softwood lath running the full length of the parlor section. The lath must have the same dimensions as the other laths on the trap. It must not be located where it will rest on the sea bottom. After disintegration, it must leave a space of at least 3¾ inches x 3¾ inches between the adjacent laths. One can also be created by an opening of at least 3 inches between adjacent laths, running the length of the parlor section, which is laced with an untreated natural fiber such as cotton, sisal, hemp, or jute not exceeding 3⁄16 inches in diameter before immersion in sea-water. Note: The Fish and Game Director may exempt specific trap designs from the escape vent and escape panel requirements if it can be conclusively proven that the specific trap design will only take crabs and is incapable of catching lobster. Approval will be granted in writing only after inspection. Each lobster or crab license holder has a color scheme or special markings indicated on their license. These must be used to mark all buoys. These colors must also be displayed on the boat, either by painting an area at least 1 square foot on the port and starboard side of the bow or by setting a painted buoy on the highest point of the boat (excluding the mast) visible for 360 degrees. The buoy or colors must be permanently attached at all times while the lobster or crab gear is being fished. *For Jonah vs. Atlantic rock crab identification, see Northern Shrimp, Other Invertebrates & Marine Plants. Lobster may not be taken by diving, angling, spearing or dipping. If you have a lobster license, you are required to report catch and effort information. For more information, call Marine Fisheries Division at 603-868-1095. Trap tags are not based on a calendar year. Trap tags are valid from June 1 – May 31. The new year tags must be affixed to traps by June 1. Trap tags can take up to 8 weeks to arrive after ordering. No more than 2 trap tags shall be affixed to traps. Recreational tags are ordered through N.H. Fish and Game Licensing Office — (603) 271-3422. All commercial and federal trap tags must be ordered through the Department’s selected vendor. Order forms are available on the N.H. Fish and Game website fishnh.com or from the Department’s Region 3 office after February 15. New order forms are sent out to previous licensees in February each year. Any questions relating to trap tag orders must go through the Region 3 office (603) 868-1095 – not the vendor.